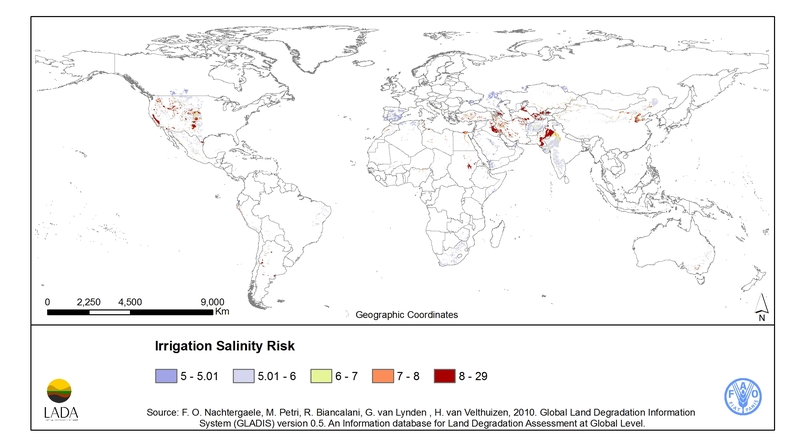 It is estimated that salinization affects around 3.8 million ha in Europe3. There are different causes of salinization but irrigated areas in particular can be affected by salinization. It is estimated that 25% of irrigated cropland in the Mediterranean area is affected by moderate to high salinization leading to moderate soil degradation4. Projected temperature increases and changes in precipitation characteristics in the Mediterranean are only likely to enhance the problem of salinization. The accumulation of salts in the soil can occur through natural processes such as physical or chemical weathering and transport from parent material, geological deposits or groundwater. It can also occur due to parent rock constituents, such as carbonate minerals and/or feldspars or as a result of the one-time submergence of soils under seawater. Sea level rise also induces seepage into areas lying below sea level. In arid areas, saline soils are formed due to evapotranspiration and lack of rainfall to flush the soils. Finally, wind in coastal areas can blow moderate amounts of salts inland. Human activities can cause salinization through the use of salt-rich irrigation water, which can be exacerbated by overexploitation of coastal groundwater aquifers causing seawater intrusion, or due to other inappropriate irrigation practices, and/or poor drainage conditions. The excessive use of water for irrigation in dry climates, with heavy soils, causes salt accumulation because they are not washed out by rainfall. The process occurs in cultivated areas where irrigation is associated with high evaporation rates and a clay texture of the soil. The practice of waterlogging without adequate drainage has also become a serious cause of soil salinization. Waterlogged soils prevent leaching of the salts imported by the irrigation water. Artificially induced salinization, such as irrigation Italy (e.g. Campania and Sicily), Spain (e.g. the Ebro Valley), Hungary (e.g. Great Alfold), Greece, Cyprus, Portugal, France (West coast), the Dalmatian coast of the Balkans, Slovakia and Romania. Also in North Europe countries (e.g. Denmark, Poland, Latvia, and Estonia). The table below lists key indicators of soil salinization, the purpose of the indicator and methods used or measuring or assessing soil salinization. How can it be protected or restored? Practices to control soil salinity include improving drainage, minimising saline water irrigation, leaching salts, isolating salts, growing halophytes, and employing good soil/water management (drip irrigation, irrigation scheduling, seedbed placement, applying organic matter). Drainage is a primary method of controlling soil salinity. A: Agronomic; M: Management; S: Structural; V: Vegetative; Adopted from Panagea et al., 20166. Always consult with local experts before implementing as limitations may apply. As salinity is responsible for the structural collapse of soil aggregates into their components it is closely linked to other soil degradation issues. Salinity is often associated with prolonged wetness and lack of surface cover and therefore increases the vulnerability of soils to erosion. Salt interacts with animals and plants, changing the ecological health of land, streams and estuaries. The greatest threat to biodiversity is from the loss of habitat both on land and in water. Biomass production - soils in salt-affected landscapes are less fertile and produce less biomass than non-saline soils resulting in less soil organic carbon (SOC) and in turn more erosion, which further accentuates SOC losses due to the dominance of plant inputs in the accumulation of organic matter. Gene pool - soil biodiversity and microorganism activity declines as EC increases, thus impacting important soil processes such as respiration, residue decomposition, nitrification, and denitrification. Physical heritage - damage to water supply infrastructure as well as transport infrastructure from shallow saline groundwater hinders the functions of soil as a physical medium for build development. 1 Jones, A., Panagos, P., Barcelo, S., Bouraoui, F., Bosco, C., Dewitte, O., Gardi, C., Hervás, J., Hiederer, R., Jeffery, S., 2012. The state of soil in Europe -a contribution of the JRC to the European Environment Agency’s Environment State and Outlook R- SOER 2010. 2 Tόth, G., Montanarella, L., and Rusco, E. (eds. ), 2008. Threats to soil quality in Europe. EUR 23438 EN. Institute for Environment and Sustainability, Land Management and Natural Hazards Unit, Office for the Official Publications of the European Communities, Luxembourg, 162pp. 3 Stanners, D., Bourdeau, P., others, 1995. Europe’s environment: the Dobris assessment, in: Europe’s Environment: The Dobrís Assessment. Office for Official Publication of the European Communities. 4 Mateo-Sagasta, J., Burke, J., 2011. Agriculture and water quality interactions: a global overview. SOLAW Background Thematic Report - TR08. 6. Panagea, I. S., Daliakopoulos, I. N., Tsanis, I. K., & Schwilch, G. (2016). Evaluation of promising technologies for soil salinity amelioration in Timpaki (Crete): a participatory approach. Solid Earth, 7(1), 177.